After months of negotiation, the UK and EU have agreed a Brexit deal. It comes in two parts. A 585-page withdrawal agreement. This is a legally-binding text that sets the terms of the UK’s divorce from the EU. It covers how much money the UK owes the EU – an estimated £39bn – and what happens to UK citizens living elsewhere in the EU and EU citizens living in the UK. It also proposes a method of avoiding the return of a physical Northern Ireland border. The UK cabinet agreed the withdrawal agreement text on 14 November, but there were two resignations, including Brexit Secretary Dominic Raab and there was an, as yet unsuccessful, attempt by Brexiteer MPs to force a confidence vote in Theresa May. The next step is for MPs to vote on the deal, which is expected to happen on 12 December after five days of debate. If they pass it, the European Parliament will get a vote before Brexit day next March. But Brexiteers do not like the prospect of being tied to EU customs rules and they say there’s no process for the UK to unilaterally decide to exit the backstop – and Northern Ireland’s Democratic Unionist Party has said it will not tolerate anything that creates a new border down the Irish Sea. As things stand, it looks unlikely. MPs are expected to vote on the deal on 12 December. Labour and all the other opposition parties in the House of Commons have said they will vote against it. Dozens of Conservative MPs – some reports say as many as 80 – are also opposed to it. And Northern Ireland’s Democratic Unionist Party, who Mrs May relies on to keep her in power, have also said they will vote against it. Theresa May is hoping to persuade MPs that the deal not only delivers on the result of the EU referendum by allowing the UK to take back control of its “money, laws and borders” it is also the best the UK can get from the EU and there is no alternative on offer. She will also argue that if her deal is voted down, Britain risks leaving without a deal – a prospect feared by many MPs, who think it will cause chaos at the ports and damage industry – or, she says, there will be “no Brexit at all”. The UK and EU negotiating teams met face-to-face for one week each month, with a few extra sessions also thrown in ahead of EU summits. 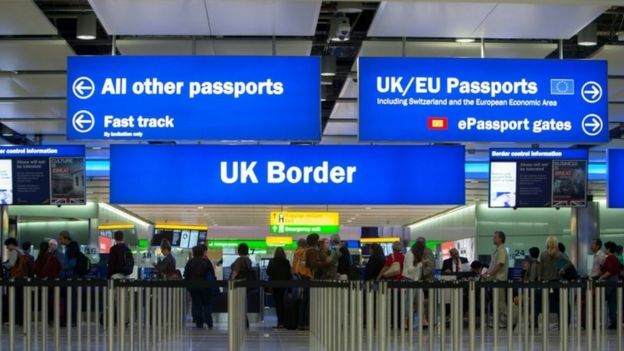 Their first tasks were trying to get an agreement on the rights of UK and EU expat citizens after Brexit, reaching a figure for the amount of money the UK will need to pay on leaving, the so-called “divorce bill”, and what happens to the Northern Ireland border. A provisional deal on these issues was reached on 8 December. They then agreed terms for the “transition” phase and now have moved on to the permanent post-Brexit relationship, while trying to agree on the precise wording of the divorce issues. Theresa May set up a government department, headed by veteran Conservative MP and Leave campaigner David Davis, to take responsibility for Brexit talks. Former defence secretary, Liam Fox, who also campaigned to leave the EU, was given the new job of international trade secretary and Boris Johnson, who was a leader of the official Leave campaign, is foreign secretary. These three were each playing roles in negotiations with the EU. However that has all changed now, with Boris Johnson and David Davis resigning over Theresa May’s preferred Brexit plan. Dominic Raab took over as Brexit secretary – but resigned in November – and Jeremy Hunt is foreign secretary. Mrs May has made clear that she is in charge of the negotiations and the new Brexit Secretary Steve Barclay will not be getting involved in the Brussels talks. Yes. Theresa May has promised there will be a Commons and Lords vote to approve the deal the UK and the rest of the EU have agreed. The Commons vote is expected to happen on 12 December. In theory, yes, but the EU side would need to agree too. The referendum result is not legally binding but the UK has triggered the automatic process of leaving the EU. There was an early post-referendum cut in interest rates, which has helped keep mortgage and other borrowing rates low. The reasonably strong performance of the UK economy, and the increase in inflation led to the Bank of England raising interest rates from 0.25% to 0.5% in November 2017 – the first increase in interest rates for 10 years – and then to 0.75% in August 2018. Interest rates going up generally makes it more expensive to pay back a mortgage or loan – but should be good news for savers as they should get amore interest on their money. The good news for Edward, from Cambridge, who asked this question, is we have been working on exactly such a list. In answer to this query from Nancy from Hornchurch – the UK is one of 10 member states who pay more into the EU budget than they get out. Only France and Germany contribute more. In 2014/15, Poland was the largest beneficiary, followed by Hungary and Greece. David, from East Sussex, is worried about what will happen to his retirement plans. At the moment, the large British expat community in Spain gets free access to Spanish GPs and their hospital treatment is paid for by the NHS. After they become permanent residents Spain pays for their hospital treatment. Dee, from Launceston, wanted to know what would happen to EU laws covering protected species such as bats in the event of Britain leaving the EU. The answer to Alan’s question, the European Commission says, is that pet passports will, like everything else, form part of the negotiations. Ste, in Bolton, asked about this. The Transatlantic Trade and Investment Partnership – or TTIP – currently under negotiation between the EU and United States would create the biggest free trade area the world has ever seen. In reply to Peter – there are basically two views on what will happen in terms of clout when outside the EU. Veronique, who lives in Italy asked this one. fter Brexit, there will be two possibilities. Declan, and Irish passport holder, might be happy to know that this is one of the few questions where I can’t see a downside as long as you are happy and comfortable carrying both passports.